Kikuhime Kukurihime from isshobin (菊姫 菊理姫 一升瓶) - yup, I made my friends drink the leftovers from 3 nights ago... 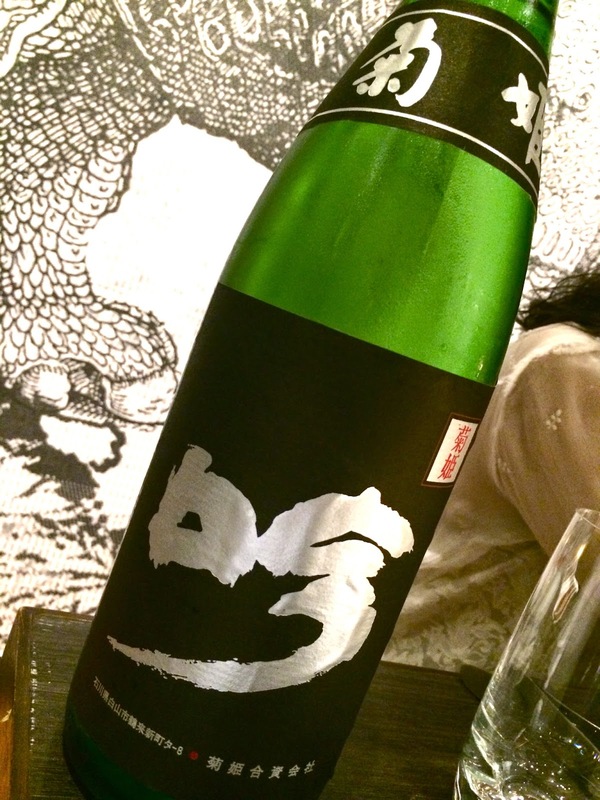 Initially the sake tasted kinda flat on the palate, but it gradually got better with aeration, and even went from smooth and sweet (甘口) to being more dry (辛口). Still drinkable, and actually I prefer it less dry. 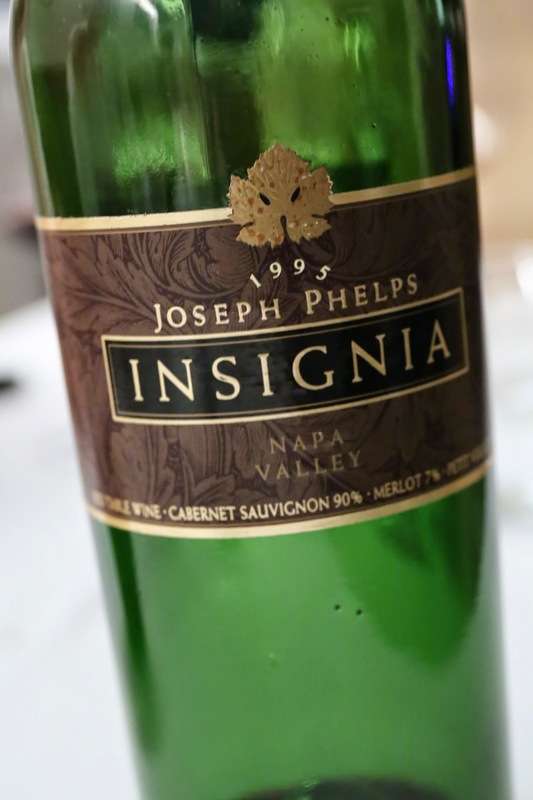 1995 Joseph Phelps Insignia - initially a little alcoholic and sharp, but turned out pretty nice and fragrant, a little smoky on top of some cedar, woodsy notes. 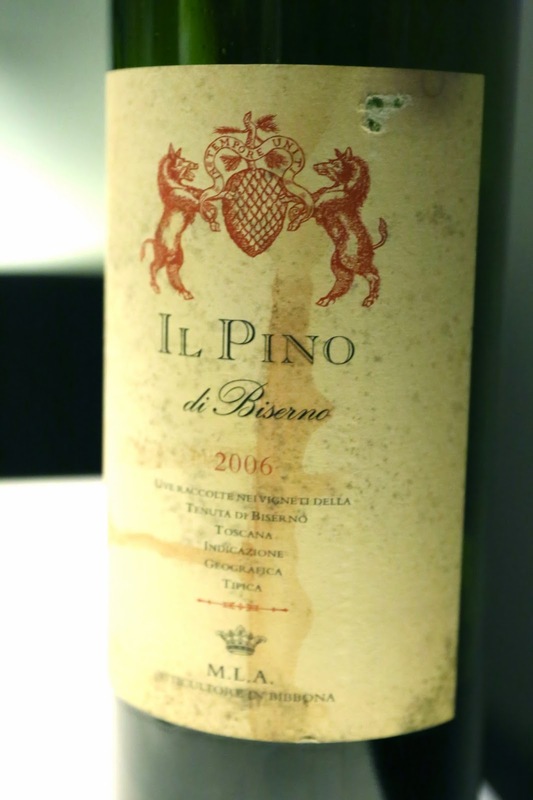 Definitely sweet on the palate since it's from a ripe vintage, and full-bodied. 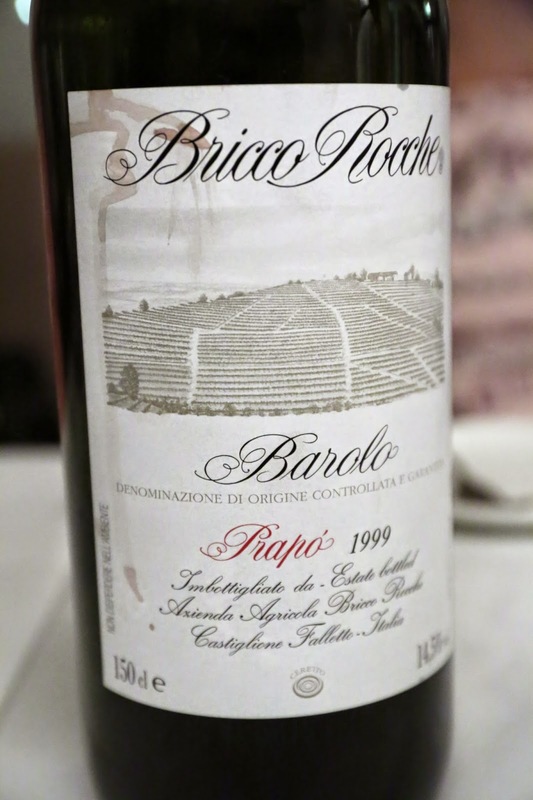 Tannins are still very much there after almost 20 years. Drinks at a friend's studio. 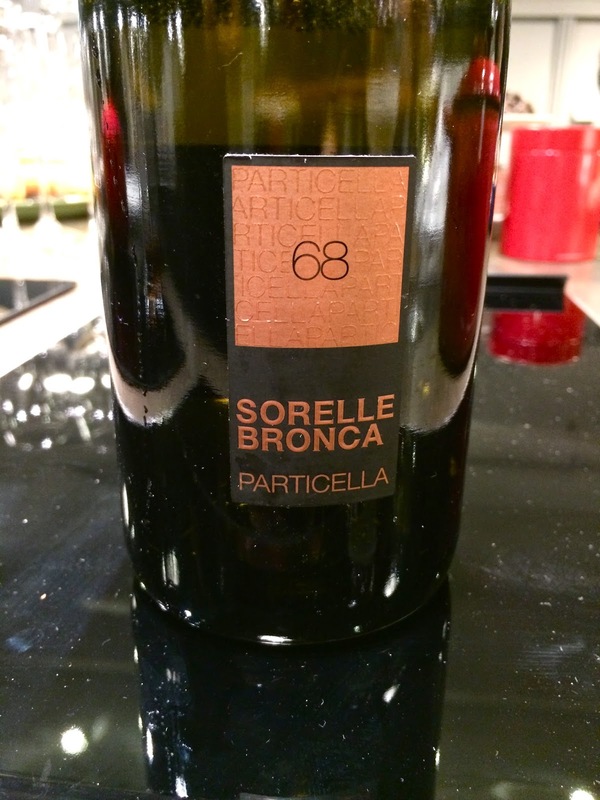 Sorelle Bronca Prosecco di Valdobbiadene PARTICELLA 68 - very floral nose, with white flowers, tropical fruits and flint. 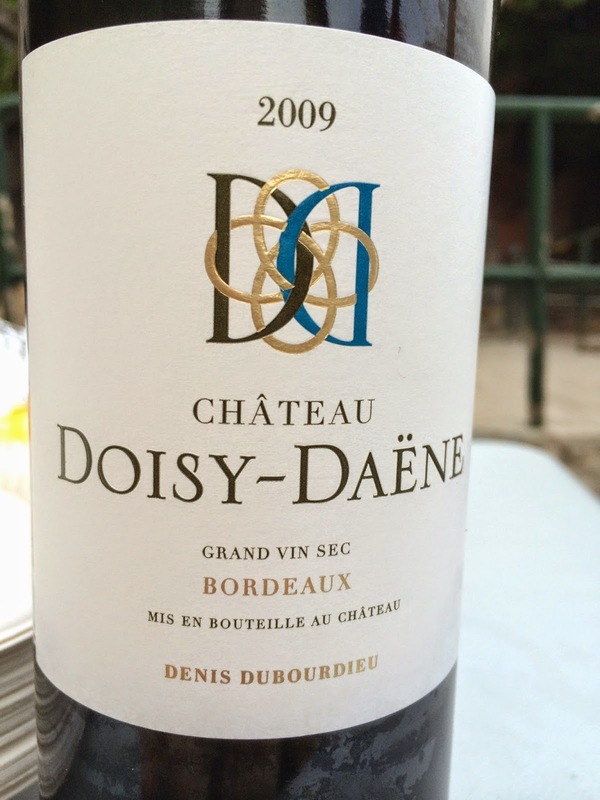 2009 Blanc de Doisy-Daëne - I loooove this wine, especially at this price point. 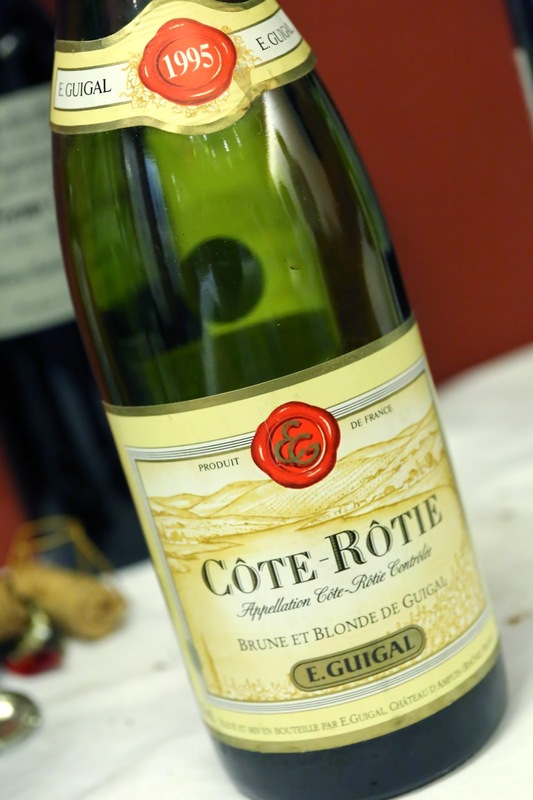 A pure and classic expression of Sauvignon Blanc, showing pipi de chat, minerals, lemon and oaky notes. Dinner at a private kitchen. 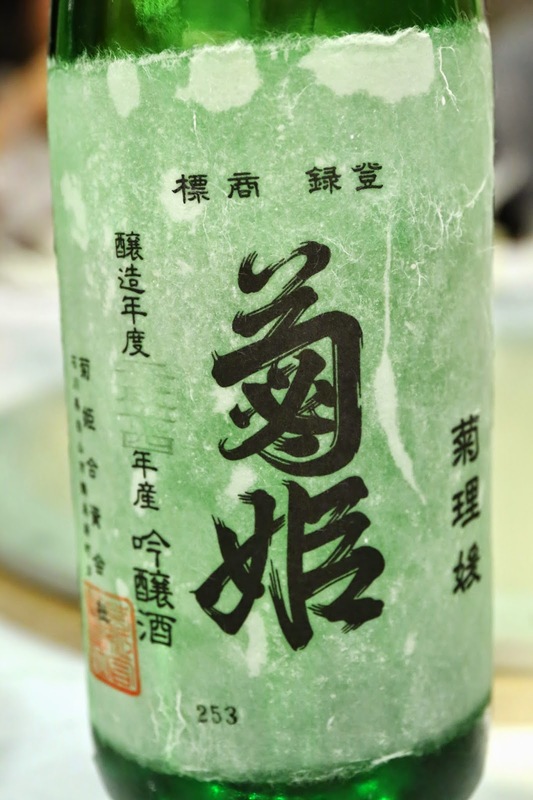 Kaiun Daiginjo Den Hase Shohiki (開運大吟醸 伝 波瀬正吉) - seimaibuai (精米歩合) of 35%. Sweeter on the attack, softer on the palate and not so dry. 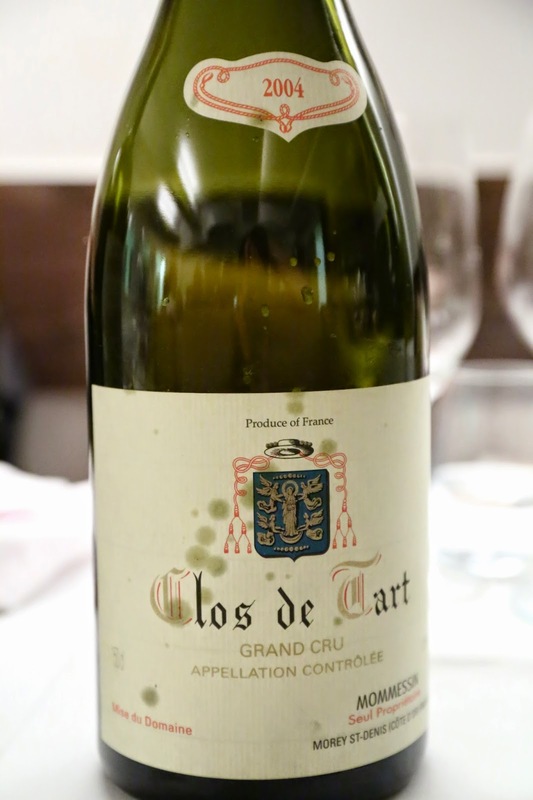 2007 Hospices de Beaune Clos de la Roche Cuvée Georges Kritter mis en bouteille par Domaine Ponsot - nice and fruity, with a very fragrant nose. A little animal and forest notes, too. 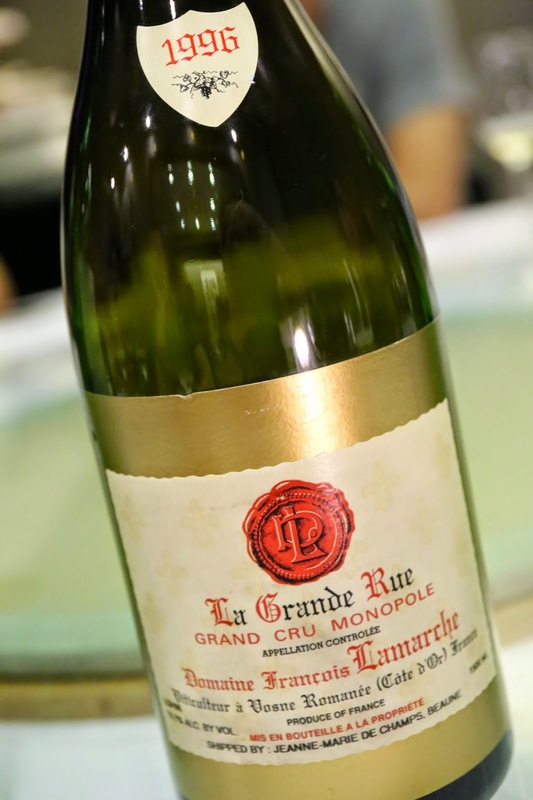 1996 François Lamarche La Grande Rue en magnum - higher acidity, more astringent on the palate. 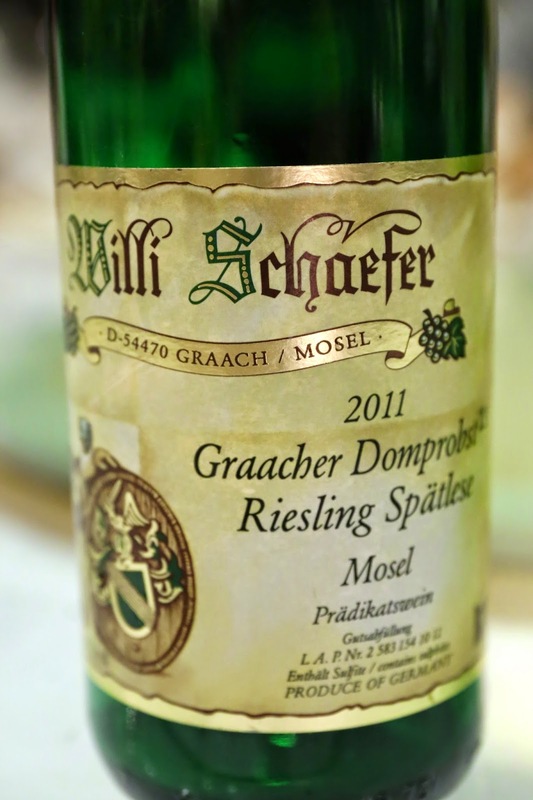 2011 Willi Schaefer Graacher Domprobst Riesling Spätlese - slightly sweet on the palate, with classic nose of polyurethane and plastic, along with floral notes. 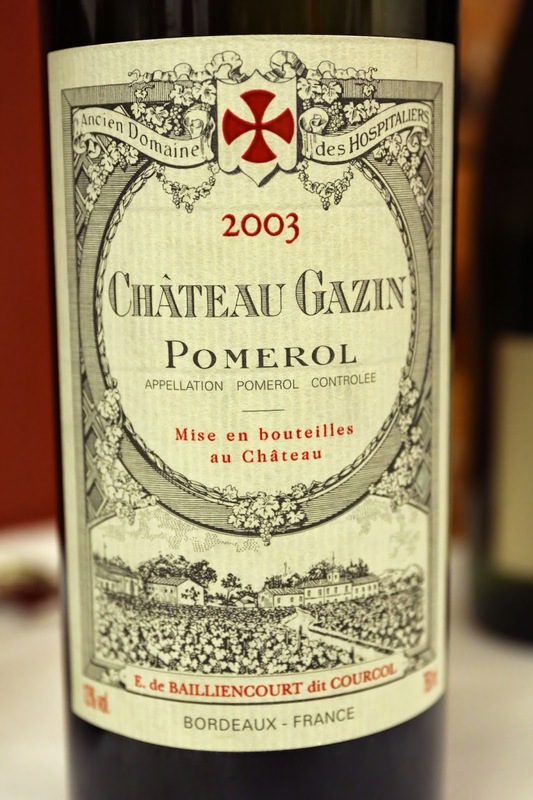 2003 Gazin - smoky nose with some fruit, with meaty and savory, mineral notes. 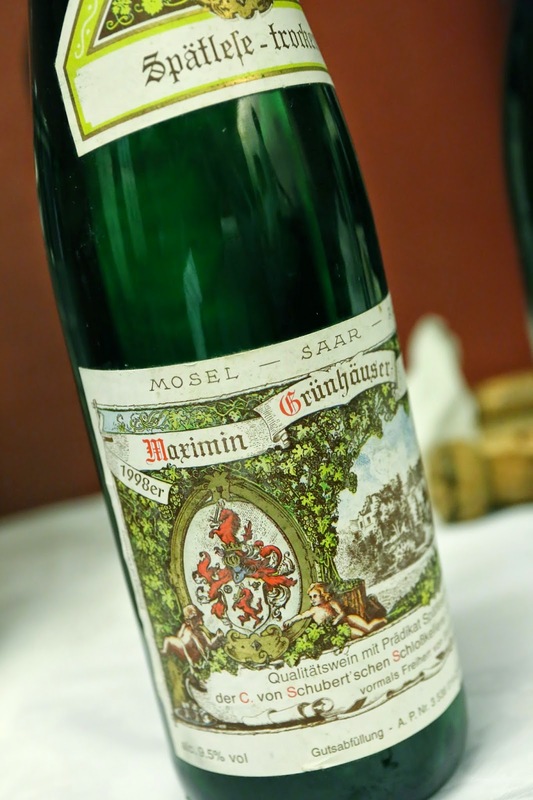 1998 von Schubert Maximin Grünhäuser Abstberg Spätlese-trocken - nose kinda pungent, stinky, almost rubber, with lemon citrus and flinty notes. 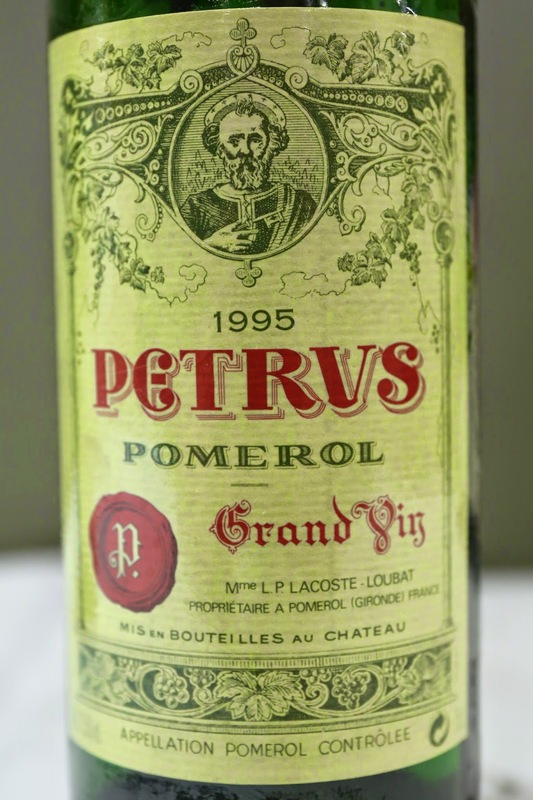 Definitely more dry and acidic but still kinda round on the palate. 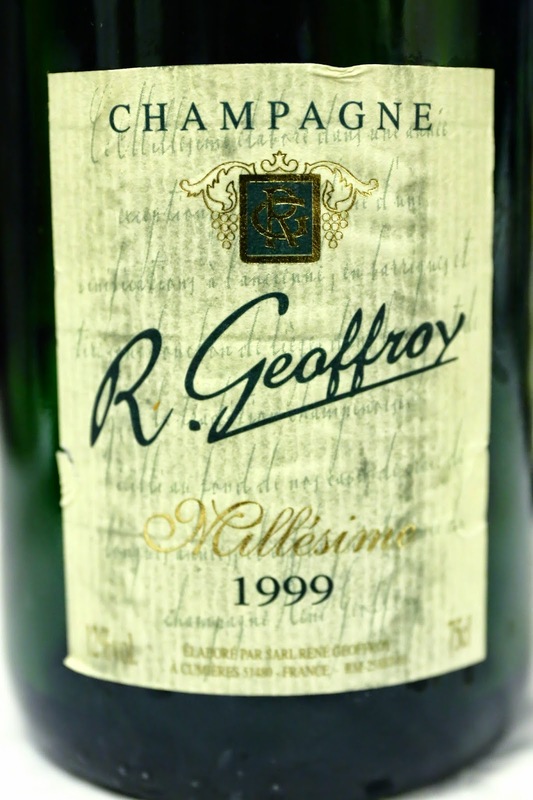 1999 René Geoffroy Brut - very ripe on the palate. 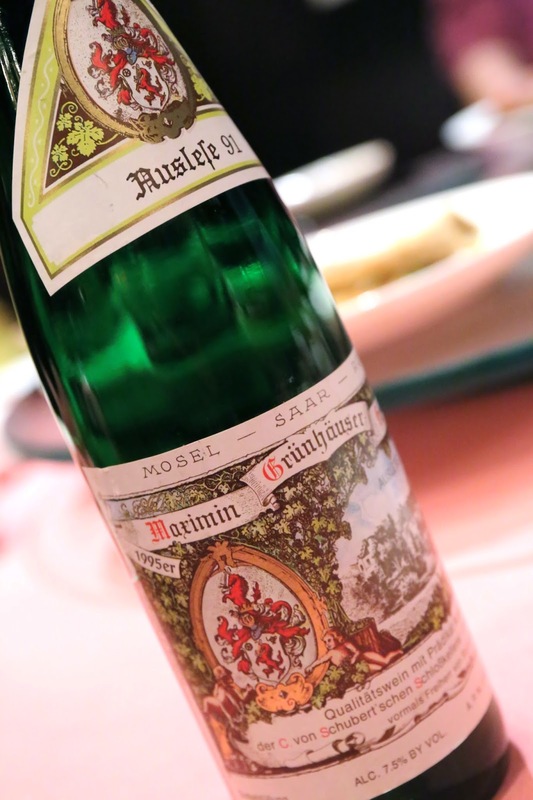 A little caramelized on the nose, and a little savory but not quite salty plum. 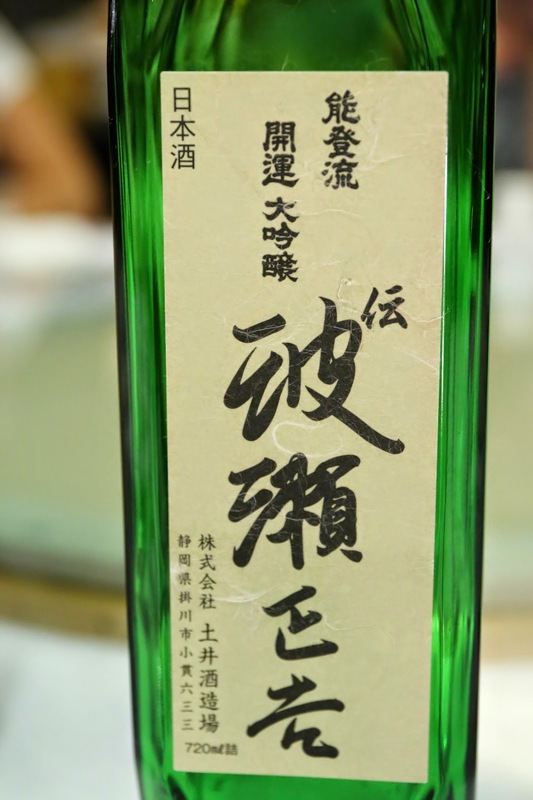 2012 Kamoshibito Kuheiji Human (醸し人九平次 純米大吟醸 Human) - made with Yamada Nishiki (山田錦) at a seimaibuai (精米歩合) of 45%. 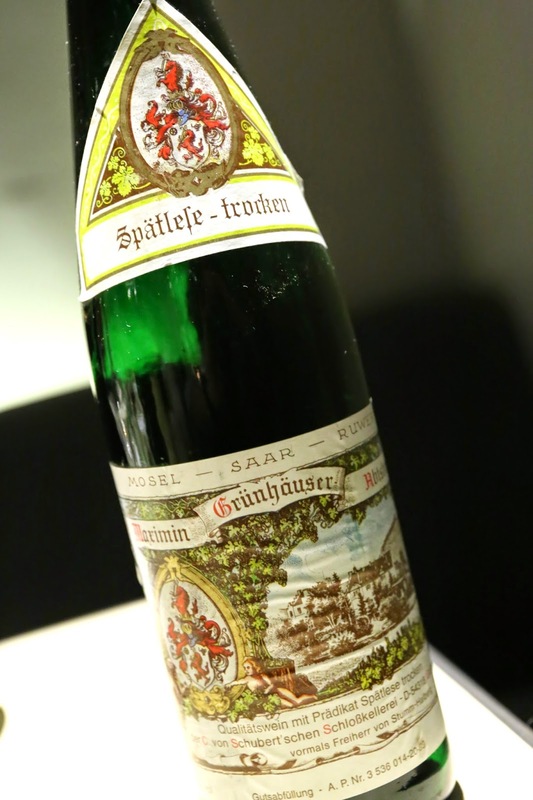 The nose was rich with lots of fermented rice notes. Alcoholic both on the nose and the palate. Very dry mid-palate and on the finish. Definitely karakuchi (辛口). 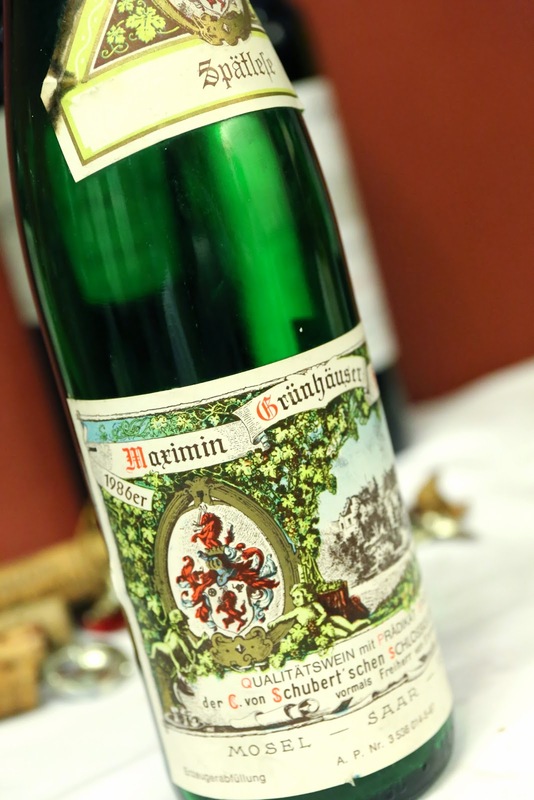 1986 von Schubert Maximin Grünhäuser Herrenberg Spätlese - lemon, almost cream soda nose, with petrol and flinty notes. 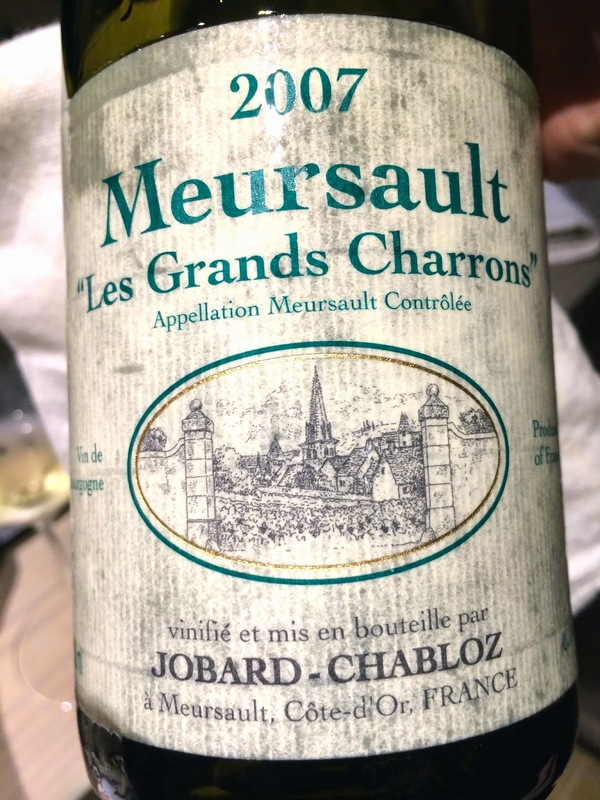 Not too sweet on the palate with good acidity. 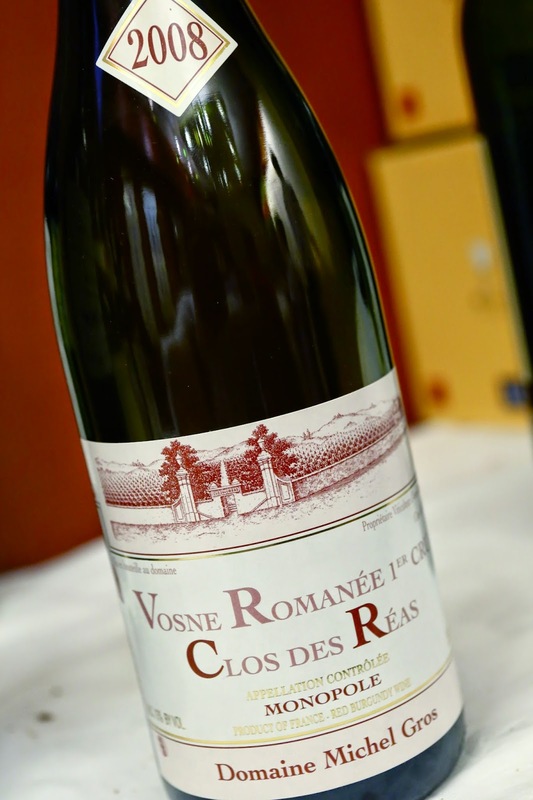 2008 Michel Gros Vosne-Romanée 1er Cru Clos des Réas - nice blackcurrant, black cherries with a bit of forest in the nose. 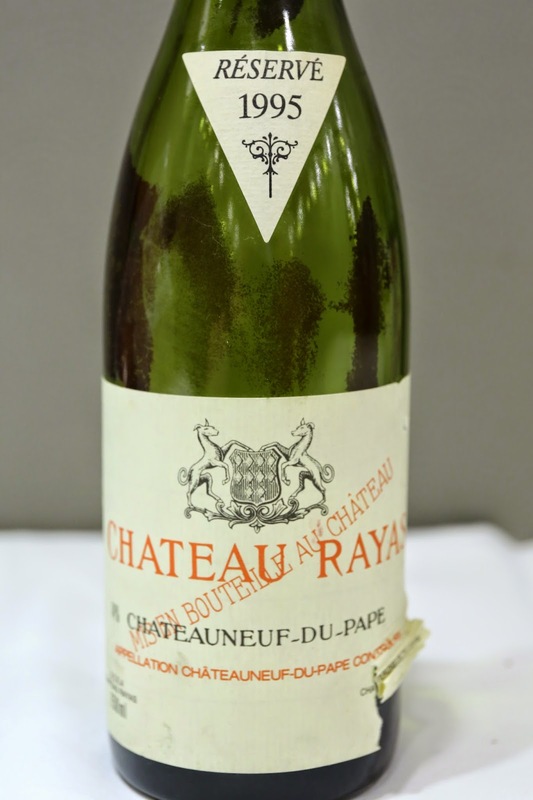 1995 Guigal Côte-Rôtie Brune et Blonde - leather, animal, and a little bacon fat. Not bad at all. 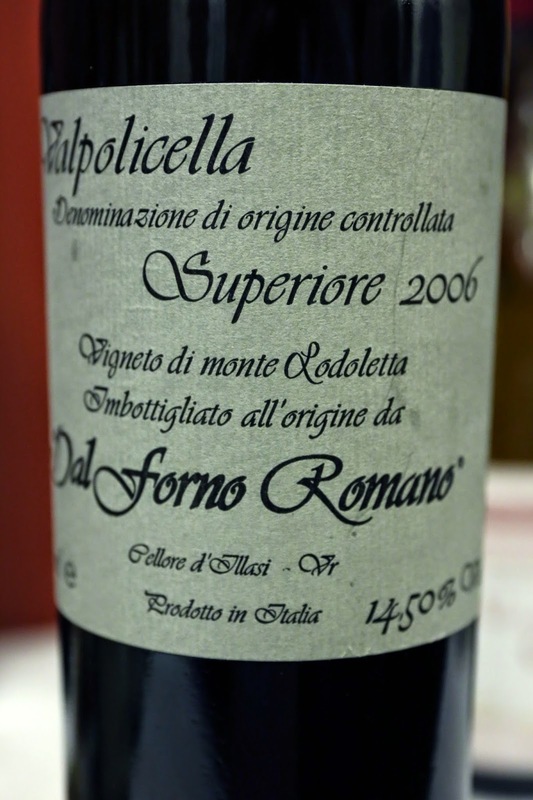 2006 Dal Forno Valpolicella Superiore - coconut, vanilla, minty, and a little smoky. Still kinda tannic. 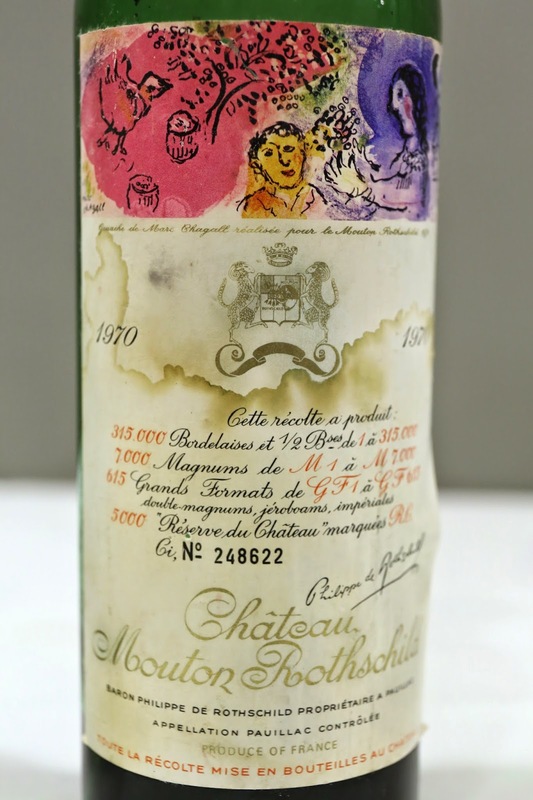 1975 Coutet - really big polyurethane nose, very rich on the palate, with apricot and nutty flavors. Yum. 2002 Moët et Chandon Cuvée Dom Pérignon - nose was surprisingly a little floral, fragrant, yeasty. A little ripe and bitter on the palate, with marmalade notes. 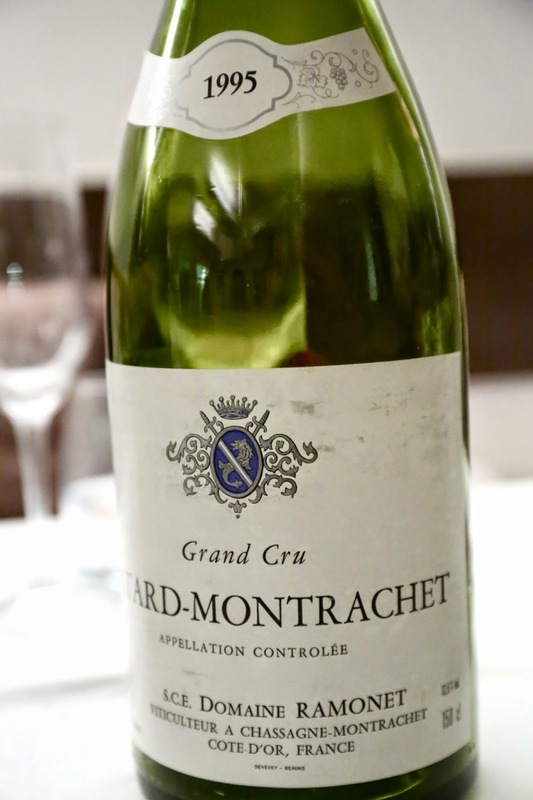 2004 Louis Carillon Puligny-Montrachet 1er Cru Les Combettes - pronounced grassy nose, a little woody. 1982 Beychevelle - very smoky with lead pencil and minty notes. Very big and lean nose that is classic Left Bank. 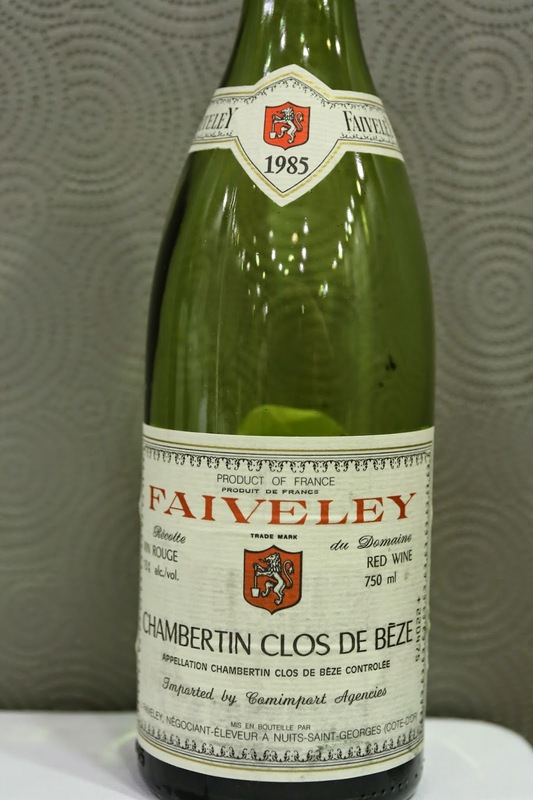 After 2 hours, the nose was really beautiful, with more ripe fruit, but also a little sharp and alcoholic. 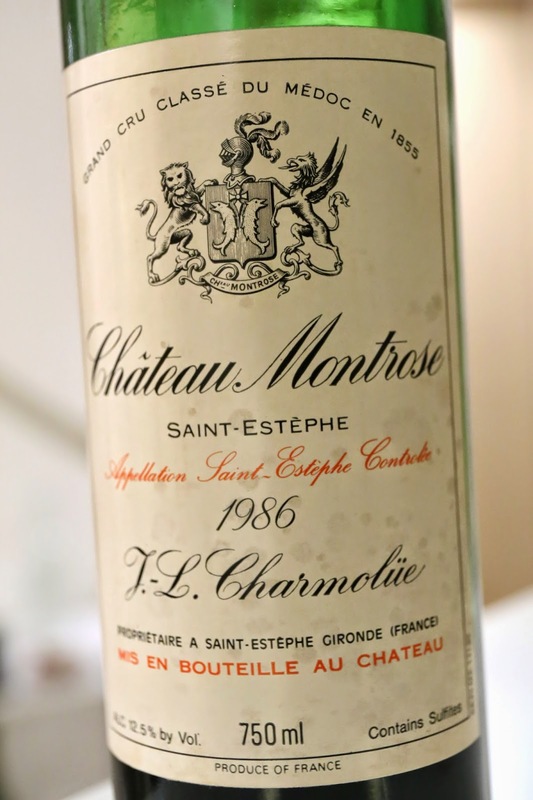 1986 Montrose - ripe nose with grilled meats, leather and smoky notes. 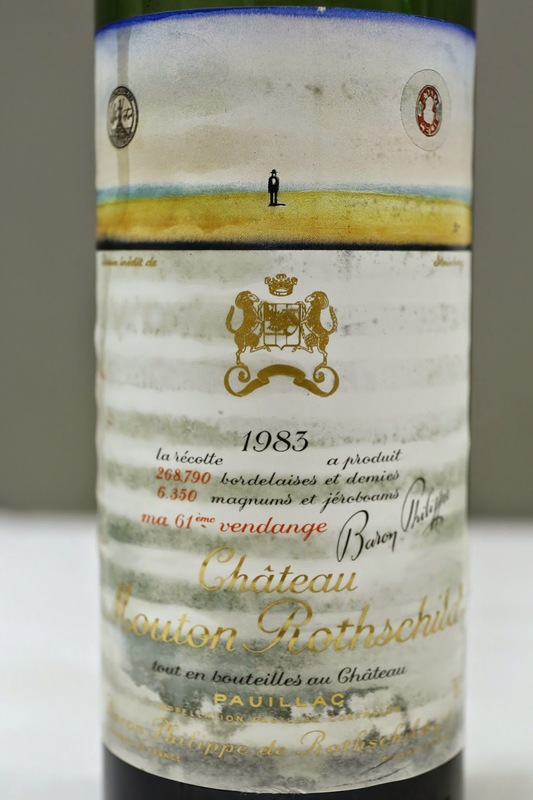 1999 Cheval Blanc - a bit spicy, smoky, slightly ripe and sweet nose. 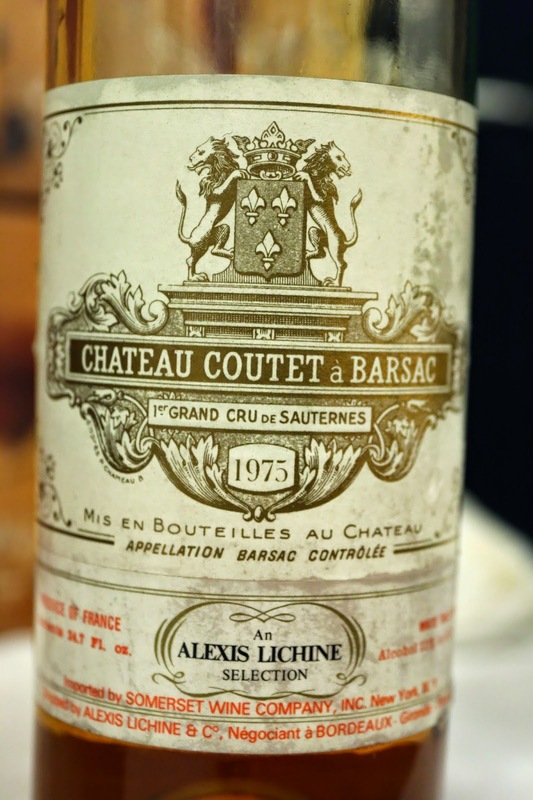 Tannins are still here. 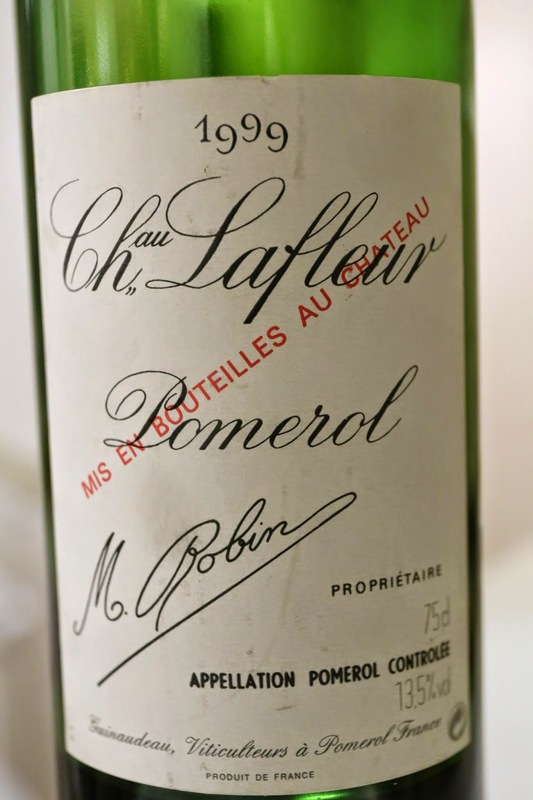 1999 Lafleur - pretty heavy smoke, a little bit peppery, alcoholic with a hint of savory notes. 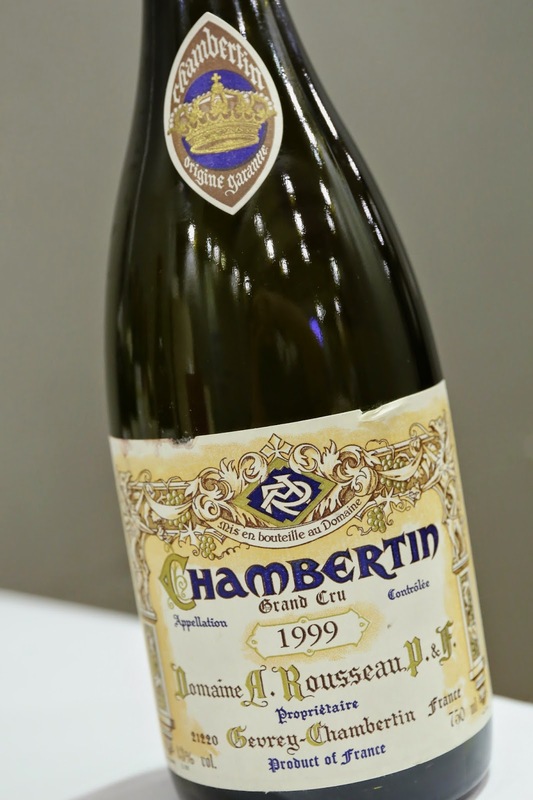 1996 Harlan Estate - really ripe and alcoholic, almost like paint-thinner with its sharpness. Really sweet on the palate. Later on a little dusty in the nose.